Riding a seven-game win streak into the final two games of the regular season, the West Chester University Golden Rams field hockey team extended the streak to nine games with a pair of wins this week against No. 9 Mercyhurst University and No. 10 Slippery Rock University. The newly No.1 nationally ranked Golden Rams traveled to Mercyhurst University on Wednesday afternoon. Coming off a hat trick in the 10-0 victory versus Mansfield, junior Alayna Brown put West Chester on the board in the 12th minute with her eighth goal of the season. That would be the lone goal for either side until the 59th minute when freshman phenom Rachal Toppi scored for her team, leading with her 19th goal of the season to put WCU up 2-0. Fellow freshman Mary Spisak scored the final goal of the afternoon in the 62nd to secure the 3-0 victory for the Golden Rams. Sophomore Sarah Krause recorded seven saves in the cage, improving to 12-2 on the season and picking up her fifth shutout of the season. 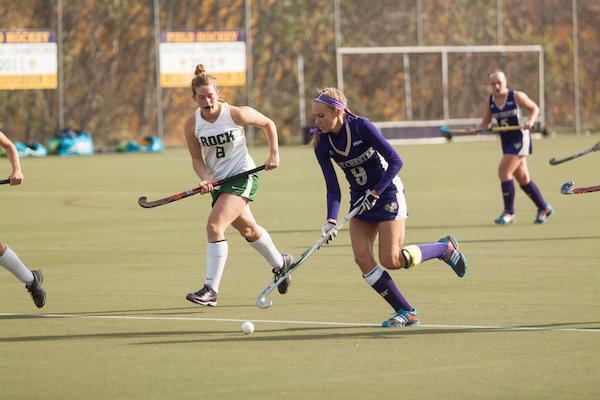 The victory over Mercyhurst came a day after West Chester found out that it moved into the No. 1 spot in both the national rankings and Atlantic Regional rankings, which is the basis for determining the NCAA Division II Tournament field. The No. 1 ranked team in the Atlantic Region will receive a bye to the national semifinals in Louisville, Kentucky next month. West Chester opens up the PSAC tournament on Nov. 14 after receiving a bye to the semifinals as the top seed. Rematches with either Millersville or Shippensburg, or both, loom in the PSAC tournament. The Golden Rams returned home for the final game of the regular season, and Senior Day, on Saturday against No. 10 Slippery Rock University. Two seniors were honored before the game, Hannah Davies and Kelsey Cheek. Davies has four goals and an assist on the season, while Cheek has three assists helping West Chester to a record of 16-2 in their final season as a Golden Ram. Sophomore Dayle Paustian opened up the scoring with her sixth goal of the season in the 11th minute, converting on a penalty stroke to give West Chester the 1-0 lead. Junior Alexis Versak continued her MVP-caliber season with her 10th goal of the season off an assist from Kristina Scherrer to give the Golden Rams the 2-0 lead in the 44th minute. Slippery Rock attempted a late surge after a goal by Kylie McCarty in the 66th minute, but the defensive group for West Chester held the fort in the final four minutes of the game to secure the 2-1 victory. Krause made two saves in the cage, to improve her record to 13-2 on the season. With the victory over Slippery Rock, West Chester clinched the regular season PSAC title and has earned a bye into the PSAC semifinals. The Golden Rams will host the first semifinal on Friday, Nov. 14 at 1 p.m. with the opponent to be determined. The path to a PSAC Championship will be not be easy, with potential rematches against powerhouses Millersville and Shippensburg. West Chester split its regular season meetings with Millersville, losing 3-2 in double overtime, and winning 2-1 at home in overtime. West Chester defeated Shippensburg 2-1 in their only meeting in the regular season. The Golden Rams close out the regular season on a nine-game win streak, scoring 72 goals in the season, while allowing only 20. The freshman sensation Toppi led the way for West Chester in the regular season, scoring 19 goals, including seven game winners, while adding two assists in her first season.